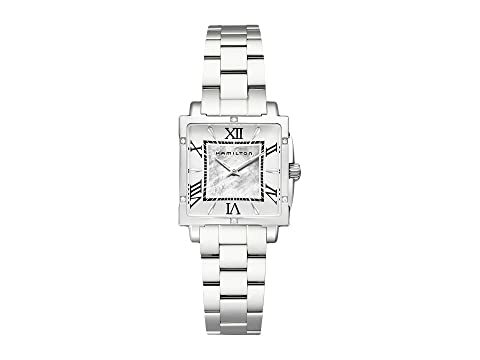 Make the evening regal on all accounts when you wear the deliciously elegant Hamilton™ Jazzmaster Square Lady watch. Two-hand analog display with ETA 901-001 quartz movement. White mother-of-pearl dial face with Roman numeral and stick indexes. We can't currently find any similar items for the Jazzmaster Square Lady - H32291114 by Hamilton. Sorry!